WOULD YOU WORK 5 OR 669 DAYS? HOW MANY WORKING DAYS ARE NEEDED TO AFFORD THIS YEAR’S iPHONES IN YOUR COUNTRY? Apple announced the new iPhones in September and with each pre-order date came a surge of sales from developed nations such as the UAE, Singapore, US and Switzerland where residents may only have to work a handful of days to purchase them, making the new iPhones a reasonably affordable amenity. However, with smartphone prices hitting astronomical new heights, price-conscious markets around the world are seeing tremendous sales volumes with budget handsets. For example, in countries such as Cuba, India, Ukraine and Russia, cell phones such as the new iPhone XS Max are truly a luxury item. HOW MANY DAYS WOULD YOU WORK TO GET ONE IN 61 COUNTRIES? 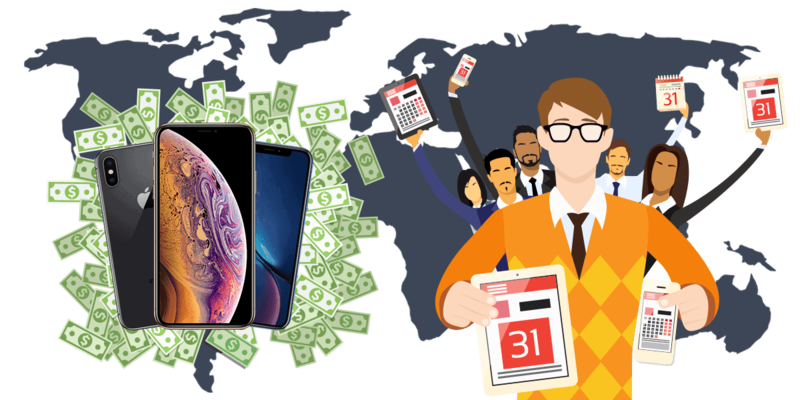 With the iPhone XR dubbed by many of the developed nation’s media outlets as the ‘budget iPhone of this year’, BankMyCell wanted to find out just how ‘affordable’ the colorful new device is. We collected the average wage after tax figures from the largest cities in each country (via numbeo) to see how much the average person earns in 2018. Out of all the countries, we shortened the list to regions where the iPhone was available to purchase through in-store and online marketplaces. As Apple’s pricing of the iPhone was different in every country, we collected costs from every region for each model to work out how many working days it would take someone to buy. The pricing below is all for the 64GB storage version of the iPhone XS, XS Max and XR to give the most affordable option. Cubans would have to work 456.8 days to buy ‘the budget’ iPhone XR 64GB, having the lowest average salary due to their Government providing housing and food. If the average citizen wanted the iPhone XS Max, they would be looking at almost two years with 669.3 work days needed on their monthly salary of $36. Residents of Bermuda had the highest salaries resulting in only 5.6 days needed to buy the most expensive iPhone XS Max 64GB! In as little as 3.8 working days they could get the cheapest option (iPhone XR) with their average monthly salary being $5,500. In Bangladesh, you could eat out 841 times at restaurants for the price of an iPhone XS Max, compared with 48 times in Bermuda. If you like a drink, head to Vietnam instead of buying an iPhone XS Max, you’ll be able to get 1,822 domestic 0.5L beers, compared with 124 beers in the UAE. You’ll be able to pay your gas, electricity, water and all other utilities in Ethiopia for 7.7 years, compared with 5 months in Berlin for the price of an iPhone XS Max. If you want to rent a fancy city center apartment in Gujarat, India, you can get it for almost 17 months for the Price of an iPhone XS Max, compared with 2 weeks in Hong Kong. They could eat out in a reasonably priced restaurant 120 times. Buy 292 domestic 0.5L beers. Pay for 8.0 months of all apartment utility bills. Rent a 1-bed city center apartment for 1.4 months. They could eat out in a reasonably priced restaurant 110 times. Buy 268 domestic 0.5L beers. Pay for 7.3 months of all apartment utility bills. Rent a 1-bed city center apartment for 1.3 months. They could eat out in a reasonably priced restaurant 72 times. Buy 175 domestic 0.5L beers. Pay for 4.8 months of all apartment utility bills. Rent a 1-bed city center apartment for 0.9 months. They could eat out in a reasonably priced restaurant 119 times. Buy 298 domestic 0.5L beers. They could eat out in a reasonably priced restaurant 106 times. Buy 266 domestic 0.5L beers. Pay for 6.5 months of all apartment utility bills. They could eat out in a reasonably priced restaurant 85 times. Buy 212 domestic 0.5L beers. Pay for 5.2 months of all apartment utility bills. Rent a 1-bed city center apartment for 1.0 months. They could eat out in a reasonably priced restaurant 841 times. Buy 490 domestic 0.5L beers. Pay for 57.1 months of all apartment utility bills. Rent a 1-bed city center apartment for 14.3 months. They could eat out in a reasonably priced restaurant 798 times. Buy 464 domestic 0.5L beers. Pay for 54.2 months of all apartment utility bills. Rent a 1-bed city center apartment for 13.5 months. They could eat out in a reasonably priced restaurant 517 times. Buy 301 domestic 0.5L beers. Pay for 35.1 months of all apartment utility bills. Rent a 1-bed city center apartment for 8.8 months. They could eat out in a reasonably priced restaurant 84 times. Buy 315 domestic 0.5L beers. Pay for 9.4 months of all apartment utility bills. Rent a 1-bed city center apartment for 1.5 months. They could eat out in a reasonably priced restaurant 77 times. Buy 290 domestic 0.5L beers. Pay for 8.6 months of all apartment utility bills. They could eat out in a reasonably priced restaurant 69 times. Buy 257 domestic 0.5L beers. Pay for 7.7 months of all apartment utility bills. They could eat out in a reasonably priced restaurant 48 times. Buy 239 domestic 0.5L beers. Pay for 5.7 months of all apartment utility bills. They could eat out in a reasonably priced restaurant 44 times. Buy 218 domestic 0.5L beers. They could eat out in a reasonably priced restaurant 33 times. Buy 163 domestic 0.5L beers. Pay for 3.9 months of all apartment utility bills. Rent a 1-bed city center apartment for 0.7 months. They could eat out in a reasonably priced restaurant 484 times. Buy 1456 domestic 0.5L beers. Pay for 11.1 months of all apartment utility bills. Rent a 1-bed city center apartment for 7.6 months. They could eat out in a reasonably priced restaurant 449 times. Buy 1352 domestic 0.5L beers. Pay for 10.3 months of all apartment utility bills. Rent a 1-bed city center apartment for 7.0 months. They could eat out in a reasonably priced restaurant 278 times. Buy 836 domestic 0.5L beers. Pay for 6.4 months of all apartment utility bills. Rent a 1-bed city center apartment for 4.3 months. They could eat out in a reasonably priced restaurant 255 times. Buy 1016 domestic 0.5L beers. Pay for 14.1 months of all apartment utility bills. Rent a 1-bed city center apartment for 3.9 months. They could eat out in a reasonably priced restaurant 233 times. Buy 929 domestic 0.5L beers. Pay for 12.9 months of all apartment utility bills. Rent a 1-bed city center apartment for 3.6 months. They could eat out in a reasonably priced restaurant 173 times. Buy 690 domestic 0.5L beers. Pay for 9.6 months of all apartment utility bills. Rent a 1-bed city center apartment for 2.7 months. They could eat out in a reasonably priced restaurant 95 times. Buy 275 domestic 0.5L beers. Pay for 14.7 months of all apartment utility bills. Rent a 1-bed city center apartment for 0.8 months. They could eat out in a reasonably priced restaurant 86 times. Buy 250 domestic 0.5L beers. Pay for 13.4 months of all apartment utility bills. They could eat out in a reasonably priced restaurant 64 times. Buy 186 domestic 0.5L beers. Pay for 10.0 months of all apartment utility bills. Rent a 1-bed city center apartment for 0.6 months. They could eat out in a reasonably priced restaurant 156 times. Buy 375 domestic 0.5L beers. Rent a 1-bed city center apartment for 2.9 months. They could eat out in a reasonably priced restaurant 143 times. Buy 344 domestic 0.5L beers. They could eat out in a reasonably priced restaurant 98 times. Buy 234 domestic 0.5L beers. Rent a 1-bed city center apartment for 1.8 months. They could eat out in a reasonably priced restaurant 320 times. Buy 960 domestic 0.5L beers. Pay for 23.4 months of all apartment utility bills. Rent a 1-bed city center apartment for 1.6 months. They could eat out in a reasonably priced restaurant 290 times. Buy 871 domestic 0.5L beers. Pay for 21.3 months of all apartment utility bills. They could eat out in a reasonably priced restaurant 217 times. Buy 650 domestic 0.5L beers. Pay for 15.9 months of all apartment utility bills. Rent a 1-bed city center apartment for 1.1 months. They could eat out in a reasonably priced restaurant 283 times. Buy 1133 domestic 0.5L beers. Pay for 13.5 months of all apartment utility bills. Rent a 1-bed city center apartment for 2.8 months. They could eat out in a reasonably priced restaurant 257 times. Buy 1030 domestic 0.5L beers. Pay for 12.2 months of all apartment utility bills. Rent a 1-bed city center apartment for 2.6 months. They could eat out in a reasonably priced restaurant 193 times. Buy 772 domestic 0.5L beers. Pay for 9.2 months of all apartment utility bills. Rent a 1-bed city center apartment for 1.9 months. They could eat out in a reasonably priced restaurant 190 times. Buy 531 domestic 0.5L beers. Pay for 19.0 months of all apartment utility bills. They could eat out in a reasonably priced restaurant 178 times. Buy 498 domestic 0.5L beers. Pay for 17.8 months of all apartment utility bills. Rent a 1-bed city center apartment for 2.5 months. They could eat out in a reasonably priced restaurant 137 times. Buy 384 domestic 0.5L beers. Pay for 13.7 months of all apartment utility bills. They could eat out in a reasonably priced restaurant 158 times. Buy 474 domestic 0.5L beers. Pay for 5.5 months of all apartment utility bills. Rent a 1-bed city center apartment for 2.3 months. They could eat out in a reasonably priced restaurant 144 times. Buy 431 domestic 0.5L beers. Pay for 5.0 months of all apartment utility bills. Rent a 1-bed city center apartment for 2.1 months. They could eat out in a reasonably priced restaurant 108 times. Buy 323 domestic 0.5L beers. Pay for 3.8 months of all apartment utility bills. The average person in Havana earns $36. In Cuba, the Government provides its resident’s housing so there are no mortgages, rents or taxes. Likewise, food and drink are provided via a ration book, so unlike the other countries, we cannot provide a cost of living association to an iPhone purchase. They could eat out in a reasonably priced restaurant 235 times. Buy 914 domestic 0.5L beers. They could eat out in a reasonably priced restaurant 214 times. Buy 833 domestic 0.5L beers. Pay for 7.0 months of all apartment utility bills. Rent a 1-bed city center apartment for 1.7 months. They could eat out in a reasonably priced restaurant 160 times. Buy 624 domestic 0.5L beers. Pay for 5.3 months of all apartment utility bills. They could eat out in a reasonably priced restaurant 82 times. Pay for 8.2 months of all apartment utility bills. They could eat out in a reasonably priced restaurant 65 times. Buy 173 domestic 0.5L beers. They could eat out in a reasonably priced restaurant 56 times. Buy 149 domestic 0.5L beers. Pay for 5.6 months of all apartment utility bills. They could eat out in a reasonably priced restaurant 384 times. Buy 900 domestic 0.5L beers. Pay for 66.2 months of all apartment utility bills. Rent a 1-bed city center apartment for 8.6 months. They could eat out in a reasonably priced restaurant 350 times. Buy 820 domestic 0.5L beers. Pay for 60.4 months of all apartment utility bills. Rent a 1-bed city center apartment for 7.8 months. They could eat out in a reasonably priced restaurant 267 times. Buy 625 domestic 0.5L beers. Pay for 46.0 months of all apartment utility bills. Rent a 1-bed city center apartment for 6.0 months. They could eat out in a reasonably priced restaurant 358 times. Buy 1790 domestic 0.5L beers. Pay for 92.7 months of all apartment utility bills. Rent a 1-bed city center apartment for 3.0 months. They could eat out in a reasonably priced restaurant 322 times. Buy 1611 domestic 0.5L beers. Pay for 83.4 months of all apartment utility bills. They could eat out in a reasonably priced restaurant 243 times. Buy 1217 domestic 0.5L beers. Pay for 63.0 months of all apartment utility bills. Rent a 1-bed city center apartment for 2.0 months. They could eat out in a reasonably priced restaurant 107 times. Buy 183 domestic 0.5L beers. Pay for 7.4 months of all apartment utility bills. Buy 168 domestic 0.5L beers. Pay for 6.9 months of all apartment utility bills. They could eat out in a reasonably priced restaurant 73 times. Buy 126 domestic 0.5L beers. Pay for 5.1 months of all apartment utility bills. They could eat out in a reasonably priced restaurant 90 times. Buy 210 domestic 0.5L beers. They could eat out in a reasonably priced restaurant 83 times. Buy 193 domestic 0.5L beers. They could eat out in a reasonably priced restaurant 54 times. Buy 125 domestic 0.5L beers. Buy 357 domestic 0.5L beers. Buy 329 domestic 0.5L beers. Pay for 4.6 months of all apartment utility bills. Buy 243 domestic 0.5L beers. Pay for 3.4 months of all apartment utility bills. They could eat out in a reasonably priced restaurant 369 times. Buy 1476 domestic 0.5L beers. Pay for 20.0 months of all apartment utility bills. They could eat out in a reasonably priced restaurant 300 times. Buy 1199 domestic 0.5L beers. Pay for 16.2 months of all apartment utility bills. They could eat out in a reasonably priced restaurant 250 times. Buy 1001 domestic 0.5L beers. They could eat out in a reasonably priced restaurant 135 times. Buy 337 domestic 0.5L beers. Pay for 9.7 months of all apartment utility bills. Rent a 1-bed city center apartment for 4.4 months. They could eat out in a reasonably priced restaurant 115 times. Buy 287 domestic 0.5L beers. Rent a 1-bed city center apartment for 3.8 months. They could eat out in a reasonably priced restaurant 93 times. Buy 232 domestic 0.5L beers. Pay for 6.7 months of all apartment utility bills. Rent a 1-bed city center apartment for 3.1 months. Buy 190 domestic 0.5L beers. Rent a 1-bed city center apartment for 0.5 months. They could eat out in a reasonably priced restaurant 172 times. Buy 172 domestic 0.5L beers. Pay for 6.6 months of all apartment utility bills. They could eat out in a reasonably priced restaurant 130 times. Buy 130 domestic 0.5L beers. Rent a 1-bed city center apartment for 0.3 months. They could eat out in a reasonably priced restaurant 259 times. Buy 976 domestic 0.5L beers. Pay for 8.9 months of all apartment utility bills. Buy 889 domestic 0.5L beers. Pay for 8.1 months of all apartment utility bills. They could eat out in a reasonably priced restaurant 176 times. Buy 666 domestic 0.5L beers. Pay for 6.1 months of all apartment utility bills. Buy 159 domestic 0.5L beers. Buy 141 domestic 0.5L beers. Buy 109 domestic 0.5L beers. Pay for 10.9 months of all apartment utility bills. They could eat out in a reasonably priced restaurant 729 times. Buy 782 domestic 0.5L beers. Pay for 41.5 months of all apartment utility bills. Rent a 1-bed city center apartment for 16.8 months. They could eat out in a reasonably priced restaurant 662 times. Buy 711 domestic 0.5L beers. Pay for 37.7 months of all apartment utility bills. Rent a 1-bed city center apartment for 15.3 months. They could eat out in a reasonably priced restaurant 543 times. Buy 583 domestic 0.5L beers. Pay for 30.9 months of all apartment utility bills. Rent a 1-bed city center apartment for 12.6 months. They could eat out in a reasonably priced restaurant 513 times. Buy 586 domestic 0.5L beers. Pay for 14.5 months of all apartment utility bills. Rent a 1-bed city center apartment for 3.5 months. They could eat out in a reasonably priced restaurant 450 times. Buy 515 domestic 0.5L beers. Pay for 12.7 months of all apartment utility bills. They could eat out in a reasonably priced restaurant 338 times. Buy 386 domestic 0.5L beers. Pay for 9.0 months of all apartment utility bills. They could eat out in a reasonably priced restaurant 80 times. Buy 217 domestic 0.5L beers. Pay for 8.4 months of all apartment utility bills. They could eat out in a reasonably priced restaurant 59 times. Buy 160 domestic 0.5L beers. Pay for 6.2 months of all apartment utility bills. They could eat out in a reasonably priced restaurant 129 times. Buy 236 domestic 0.5L beers. Pay for 9.1 months of all apartment utility bills. They could eat out in a reasonably priced restaurant 109 times. Buy 200 domestic 0.5L beers. They could eat out in a reasonably priced restaurant 87 times. They could eat out in a reasonably priced restaurant 78 times. Buy 368 domestic 0.5L beers. Buy 340 domestic 0.5L beers. Buy 254 domestic 0.5L beers. Pay for 7.1 months of all apartment utility bills. They could eat out in a reasonably priced restaurant 125 times. Buy 330 domestic 0.5L beers. Pay for 6.0 months of all apartment utility bills. They could eat out in a reasonably priced restaurant 113 times. Pay for 5.4 months of all apartment utility bills. Buy 224 domestic 0.5L beers. Pay for 4.1 months of all apartment utility bills. They could eat out in a reasonably priced restaurant 310 times. Buy 767 domestic 0.5L beers. Pay for 30.4 months of all apartment utility bills. They could eat out in a reasonably priced restaurant 284 times. Buy 702 domestic 0.5L beers. Pay for 27.9 months of all apartment utility bills. They could eat out in a reasonably priced restaurant 220 times. Buy 544 domestic 0.5L beers. Pay for 21.6 months of all apartment utility bills. They could eat out in a reasonably priced restaurant 66 times. Buy 225 domestic 0.5L beers. They could eat out in a reasonably priced restaurant 49 times. Buy 165 domestic 0.5L beers. Pay for 3.7 months of all apartment utility bills. They could eat out in a reasonably priced restaurant 551 times. Buy 367 domestic 0.5L beers. Rent a 1-bed city center apartment for 2.4 months. They could eat out in a reasonably priced restaurant 500 times. Buy 334 domestic 0.5L beers. Pay for 25.3 months of all apartment utility bills. Rent a 1-bed city center apartment for 2.2 months. Buy 207 domestic 0.5L beers. Pay for 15.7 months of all apartment utility bills. They could eat out in a reasonably priced restaurant 268 times. Buy 1072 domestic 0.5L beers. Pay for 47.6 months of all apartment utility bills. Rent a 1-bed city center apartment for 5.2 months. They could eat out in a reasonably priced restaurant 244 times. Buy 972 domestic 0.5L beers. Pay for 43.2 months of all apartment utility bills. Rent a 1-bed city center apartment for 4.7 months. They could eat out in a reasonably priced restaurant 184 times. Buy 734 domestic 0.5L beers. Pay for 32.6 months of all apartment utility bills. They could eat out in a reasonably priced restaurant 448 times. Buy 629 domestic 0.5L beers. Pay for 37.0 months of all apartment utility bills. They could eat out in a reasonably priced restaurant 414 times. Buy 580 domestic 0.5L beers. Pay for 34.2 months of all apartment utility bills. They could eat out in a reasonably priced restaurant 305 times. Buy 427 domestic 0.5L beers. Pay for 25.2 months of all apartment utility bills. Buy 297 domestic 0.5L beers. Buy 273 domestic 0.5L beers. They could eat out in a reasonably priced restaurant 57 times. Buy 202 domestic 0.5L beers. They could eat out in a reasonably priced restaurant 116 times. Buy 233 domestic 0.5L beers. Pay for 12.4 months of all apartment utility bills. Rent a 1-bed city center apartment for 1.2 months. They could eat out in a reasonably priced restaurant 105 times. Buy 211 domestic 0.5L beers. Pay for 11.2 months of all apartment utility bills. Buy 155 domestic 0.5L beers. Pay for 8.3 months of all apartment utility bills. They could eat out in a reasonably priced restaurant 76 times. Buy 1420 domestic 0.5L beers. Pay for 26.8 months of all apartment utility bills. Rent a 1-bed city center apartment for 4.9 months. Buy 1108 domestic 0.5L beers. Pay for 20.9 months of all apartment utility bills. They could eat out in a reasonably priced restaurant 36 times. Buy 676 domestic 0.5L beers. Pay for 12.8 months of all apartment utility bills. Buy 147 domestic 0.5L beers. Pay for 7.6 months of all apartment utility bills. Buy 135 domestic 0.5L beers. They could eat out in a reasonably priced restaurant 58 times. Buy 102 domestic 0.5L beers. They could eat out in a reasonably priced restaurant 669 times. Buy 556 domestic 0.5L beers. Pay for 22.4 months of all apartment utility bills. Rent a 1-bed city center apartment for 6.8 months. They could eat out in a reasonably priced restaurant 593 times. Buy 493 domestic 0.5L beers. Pay for 19.8 months of all apartment utility bills. Buy 452 domestic 0.5L beers. Pay for 18.2 months of all apartment utility bills. Rent a 1-bed city center apartment for 5.5 months. They could eat out in a reasonably priced restaurant 374 times. Buy 1244 domestic 0.5L beers. They could eat out in a reasonably priced restaurant 340 times. Buy 1128 domestic 0.5L beers. Pay for 10.1 months of all apartment utility bills. Buy 846 domestic 0.5L beers. They could eat out in a reasonably priced restaurant 274 times. Buy 683 domestic 0.5L beers. They could eat out in a reasonably priced restaurant 240 times. Buy 599 domestic 0.5L beers. They could eat out in a reasonably priced restaurant 186 times. Buy 465 domestic 0.5L beers. Buy 640 domestic 0.5L beers. Pay for 13.8 months of all apartment utility bills. They could eat out in a reasonably priced restaurant 148 times. Buy 591 domestic 0.5L beers. Buy 440 domestic 0.5L beers. Pay for 9.5 months of all apartment utility bills. They could eat out in a reasonably priced restaurant 194 times. Buy 728 domestic 0.5L beers. They could eat out in a reasonably priced restaurant 175 times. Buy 655 domestic 0.5L beers. Rent a 1-bed city center apartment for 3.2 months. They could eat out in a reasonably priced restaurant 133 times. Buy 1563 domestic 0.5L beers. Buy 1416 domestic 0.5L beers. They could eat out in a reasonably priced restaurant 163 times. Buy 1047 domestic 0.5L beers. They could eat out in a reasonably priced restaurant 245 times. Buy 1081 domestic 0.5L beers. Pay for 19.2 months of all apartment utility bills. Rent a 1-bed city center apartment for 3.4 months. They could eat out in a reasonably priced restaurant 196 times. Buy 862 domestic 0.5L beers. Pay for 15.3 months of all apartment utility bills. They could eat out in a reasonably priced restaurant 145 times. Buy 637 domestic 0.5L beers. Pay for 11.3 months of all apartment utility bills. Pay for 13.0 months of all apartment utility bills. They could eat out in a reasonably priced restaurant 171 times. Pay for 11.9 months of all apartment utility bills. They could eat out in a reasonably priced restaurant 127 times. Buy 136 domestic 0.5L beers. They could eat out in a reasonably priced restaurant 200 times. Buy 791 domestic 0.5L beers. Pay for 25.0 months of all apartment utility bills. They could eat out in a reasonably priced restaurant 183 times. Buy 724 domestic 0.5L beers. Pay for 22.8 months of all apartment utility bills. Buy 527 domestic 0.5L beers. Pay for 16.6 months of all apartment utility bills. They could eat out in a reasonably priced restaurant 126 times. Buy 419 domestic 0.5L beers. Buy 387 domestic 0.5L beers. Pay for 8.7 months of all apartment utility bills. Buy 286 domestic 0.5L beers. They could eat out in a reasonably priced restaurant 730 times. Buy 626 domestic 0.5L beers. Pay for 29.0 months of all apartment utility bills. They could eat out in a reasonably priced restaurant 621 times. Buy 533 domestic 0.5L beers. Pay for 24.7 months of all apartment utility bills. Rent a 1-bed city center apartment for 4.0 months. They could eat out in a reasonably priced restaurant 549 times. Buy 470 domestic 0.5L beers. Pay for 21.8 months of all apartment utility bills. They could eat out in a reasonably priced restaurant 117 times. Pay for 18.1 months of all apartment utility bills. Buy 198 domestic 0.5L beers. They could eat out in a reasonably priced restaurant 79 times. Pay for 12.3 months of all apartment utility bills. Buy 216 domestic 0.5L beers. They could eat out in a reasonably priced restaurant 60 times. Buy 146 domestic 0.5L beers. They could eat out in a reasonably priced restaurant 548 times. Buy 548 domestic 0.5L beers. They could eat out in a reasonably priced restaurant 498 times. They could eat out in a reasonably priced restaurant 373 times. Buy 373 domestic 0.5L beers. Pay for 11.0 months of all apartment utility bills. They could eat out in a reasonably priced restaurant 590 times. Buy 845 domestic 0.5L beers. Pay for 36.6 months of all apartment utility bills. Rent a 1-bed city center apartment for 11.1 months. They could eat out in a reasonably priced restaurant 531 times. Buy 760 domestic 0.5L beers. Pay for 32.9 months of all apartment utility bills. Rent a 1-bed city center apartment for 10.0 months. They could eat out in a reasonably priced restaurant 466 times. Buy 667 domestic 0.5L beers. Pay for 28.9 months of all apartment utility bills. They could eat out in a reasonably priced restaurant 345 times. Buy 1793 domestic 0.5L beers. Pay for 18.3 months of all apartment utility bills. They could eat out in a reasonably priced restaurant 315 times. Buy 1634 domestic 0.5L beers. Pay for 16.7 months of all apartment utility bills. Buy 1219 domestic 0.5L beers. Buy 124 domestic 0.5L beers. They could eat out in a reasonably priced restaurant 169 times. Buy 113 domestic 0.5L beers. Pay for 9.9 months of all apartment utility bills. Buy 85 domestic 0.5L beers. They could eat out in a reasonably priced restaurant 81 times. They could eat out in a reasonably priced restaurant 74 times. Pay for 6.8 months of all apartment utility bills. They could eat out in a reasonably priced restaurant 55 times. Buy 187 domestic 0.5L beers. They could eat out in a reasonably priced restaurant 52 times. Buy 188 domestic 0.5L beers. Pay for 4.9 months of all apartment utility bills. They could eat out in a reasonably priced restaurant 695 times. Buy 1822 domestic 0.5L beers. Pay for 26.9 months of all apartment utility bills. They could eat out in a reasonably priced restaurant 616 times. Buy 1616 domestic 0.5L beers. Pay for 23.9 months of all apartment utility bills. They could eat out in a reasonably priced restaurant 473 times. Buy 1239 domestic 0.5L beers. Daily wages after tax are taken from 2018 numbeo figures and converted into dollars. Working days is based on an average of 21.62 working days in a month across all territories. All iPhone XS/XS Max/XR 64GB model pricing is taken from e-commerce websites or otherwise reputable news websites within their regions. All iPhone figures have been converted into USD with the current exchange rate on 23rd October 2018 via Google. Monthly USD after-tax earnings are divided by the monthly wage to give a daily wage value that is then divided into the USD price in each territory. Download web optimized versions of the charts in this study and sources of the data.